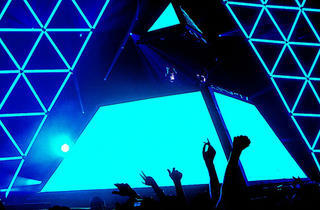 Lasers, pyramids, giant heads, spaceships, spheres. The live DJ show is all about the spectacle. 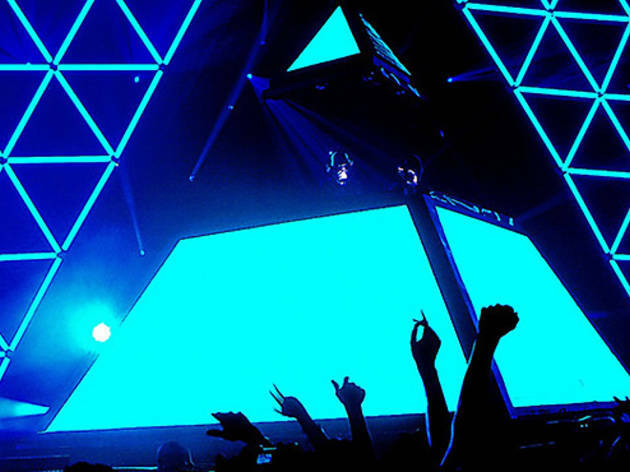 These are the greatest live productions in electronic music. 13. 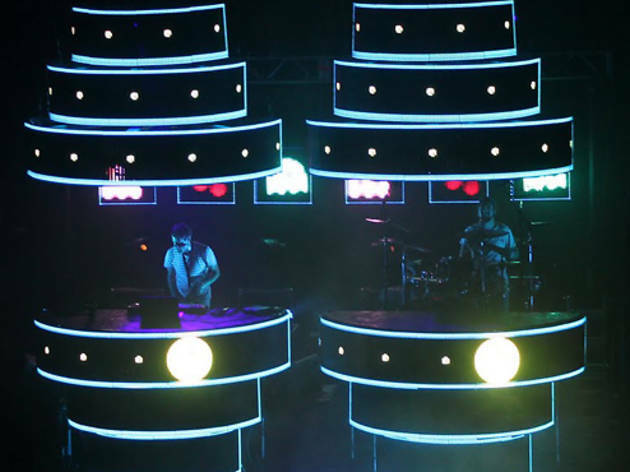 Big Gigantic's pods, 2012 The duo honked saxophone and bashed drums inside these conical pods, which looked like Devo hats or collapsible drinking cups for camping. Pretty appropriate evocations for an act that plays jam-friendly robotic pop. Photograph: Jeff Kroll12. 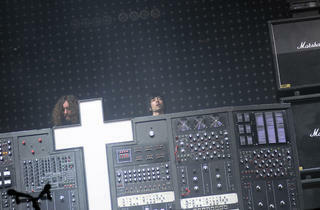 Justice - Audio. Video. Disco. 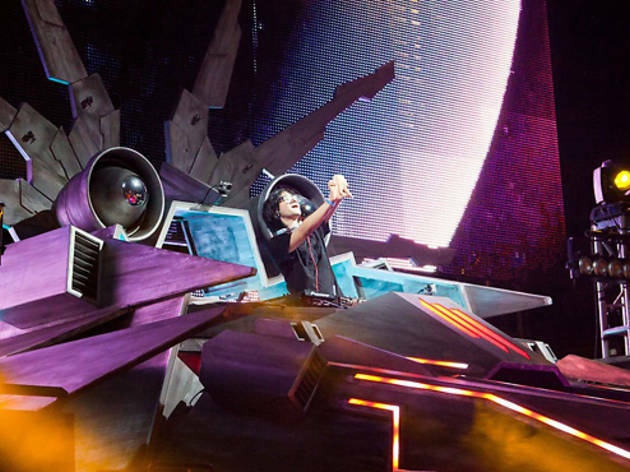 Tour, 2012&ndash;2013 The French twosome underlined the notion that DJing is the new rock &amp; roll with this headbanger-friendly array. Massive stacks of Marshall amps (which were actually lights) flanked a booth made of retro circuit boards. 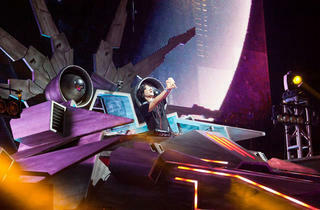 At one point in the show, a piano ejects from the front. It's as if Metallica and Liberace collaborted on the set of Battlestar Galactica. 11. 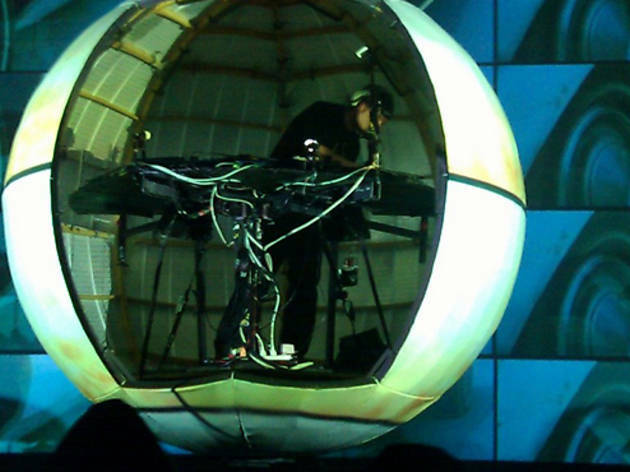 DJ Shadow's Shadowsphere, 2010&ndash;12 Clever, dizzying projections turned Shadow's blank orb into a baseball, basketball, soccer ball, Death Star, sun, disco ball and more. It would have scored higher if not for some somewhat Spinal Tap&ndash;esque outings where blinding sun killed the effect. 10. 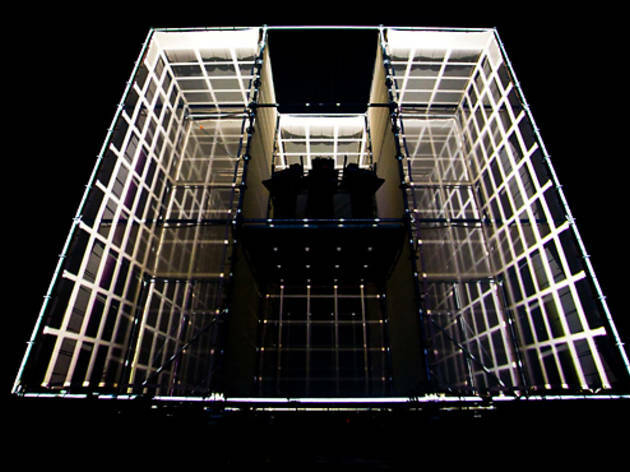 Etienne de Crecy's cubes, 2008&ndash; The French vet played inside this towering stack of cubes, which looked like the set of Hollywood Squares, with Crecy being the permanent center square. Which would make him the Paul Lynde or Joan Rivers of DJs. Sorry, that's a reference that no one who follows EDM will get. Photograph: V Squared Labs/Ruke.com9. 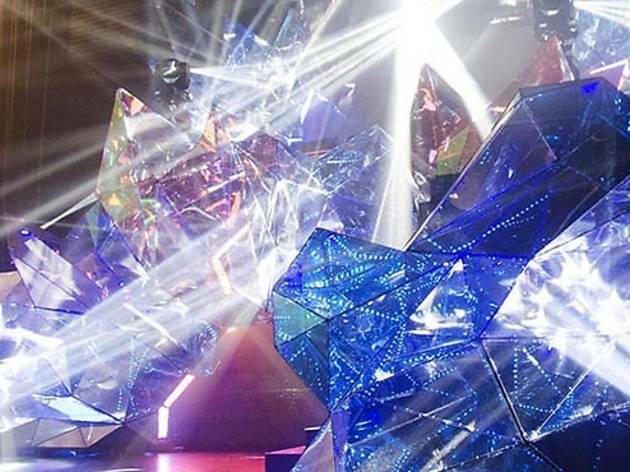 Krewella's Crystal Volcano, 2013&ndash; The Chicago-born trio promoted its major-label debut, Get Wet, with this pile of gems that recalled Superman's Fortress of Solitude and The Dark Crystal. A cool way to up your laser game: Add a fuckton of reflecting surfaces. &nbsp; Making of The Krewella Volcano from V Squared Labs Inc. on Vimeo. Photograph: V Squared Labs/Ruke.com8. 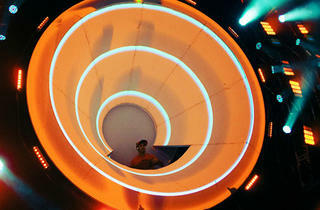 Datsik's Vortex Lumen, 2013&ndash;onward The Canadian dubstep producer sits inside what looks like a massive speaker cone. It's appropriate for someone so focused on bass booms. 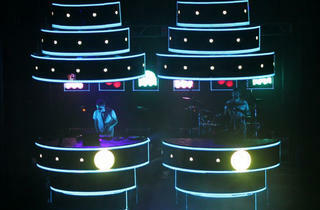 &nbsp; DATSIK - Case Study from V Squared Labs Inc. on Vimeo. 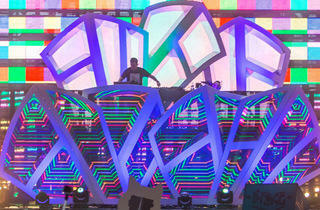 Photograph: V Squared Labs/Rukes.com7. Dillon Francis's The "Gary," 2014 The newest entry on the list, the Mad Decent beat dropper and moombahton pioneer took inspiration from the swooping metal panels of architect Frank Genry (hence the sly name). It ends up evoking street graffiti as well, like an animated tag on the side of a train car. Dillon Francis "The Gary" from V Squared Labs Inc. on Vimeo. 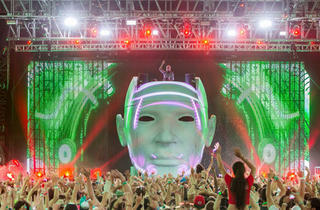 Photograph: Rukes.com6. 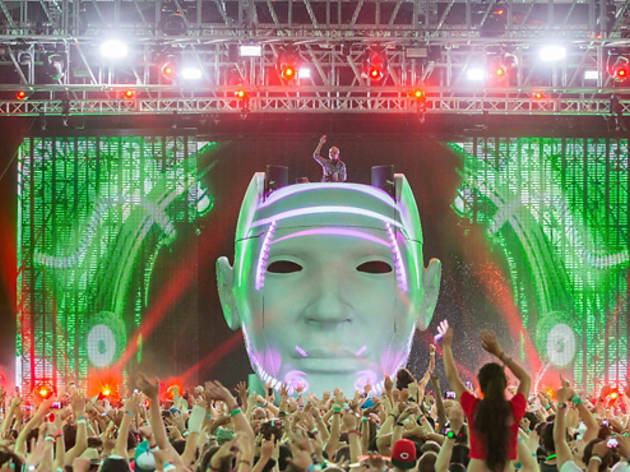 Avicii's giant head, 2012 The Swedish superstar perched atop a massive face, which recalled the Buddha heads of Cambodia and Thailand, if they were the gods of molly in Vegas. Egotistical, perhaps, but still imposing and cool. It would have scored higher if more stuff shot out of the nose, eyes and mouth. 5. 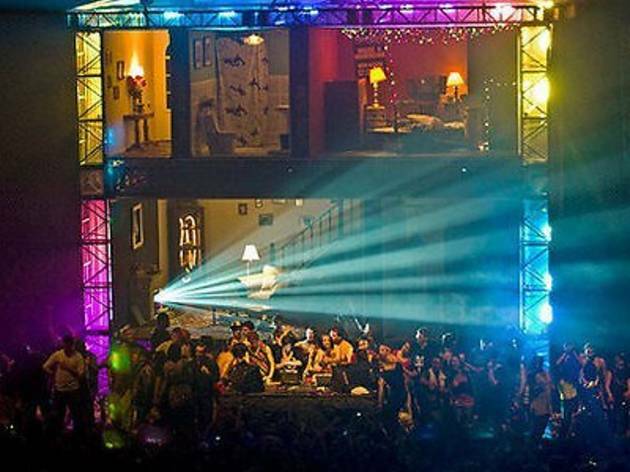 Girl Talk's house, 2009 At an epic New Year's Eve gig at the Congress in Chicago, mash-up master Gregg Gillis constructed this two-story, five-room, life-size dollhouse, a reference to the house on the cover of his Feed the Animals album. During the show, actors in each of the rooms of the house played out scenes of domestic drama and teenage life. 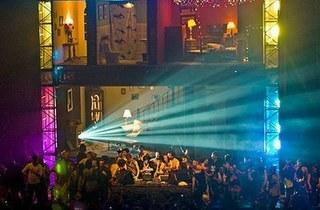 High school theater meets frat party. 3. Deadmau5's MAU5CUBE, 2011-12 The light-up helmet makes for a striking image set above the fractured laser-cube of the DJ booth. It looks like a W, or a dismantled Rubik's Cube, though its thousands of tiny lights allowed it to morph into cosmic speaker cabinets, psychedelic portals, etc. 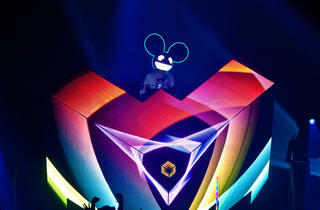 &nbsp; Deadmau5 - Professional Griefers from POSSIBLE on Vimeo. Photograph: V Squared Labs2. 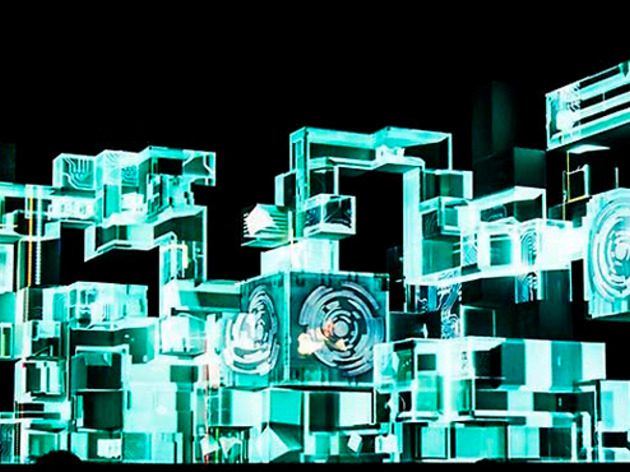 Amon Tobin's ISAM, 2011&ndash;13 The Brazilian veteran of the Ninja Tune label blew minds with this massive array of cubes and rectacles, which acted as screens for a complicated light show. The scope of it was stunning for an act that frankly (and sadly) is not as popular. It helps that his music is more interesting and complex that the bulk of the acts here, too. Museum-worthy stuff. 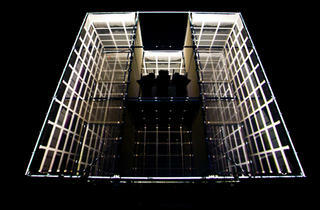 &nbsp; Amon Tobin ISAM v2.0 from V Squared Labs Inc. on Vimeo. We are past the notion that DJing is not a live extravaganza. The days of some geek merely standing behind turntables or a laptop, tapping the track pad, are (largely) behind us. 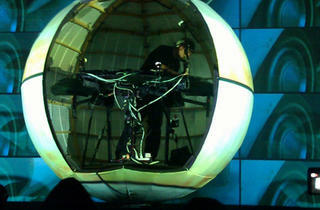 Electronic concerts are more akin to Cirque du Soleil than rock & roll gigs. Not surprising, considering how much time DJs spend in Las Vegas. Those millions of light bulbs must be inspirational. 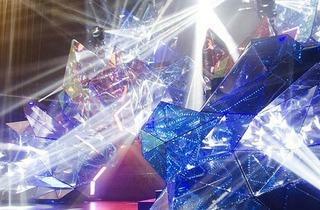 The EDM show has replaced guitar music as a spectacular arena experience. 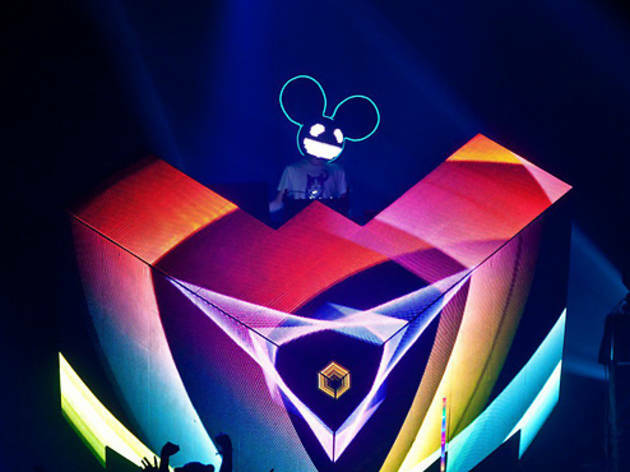 A Deadmau5 concert looks far more like a Pink Floyd show than one by the Black Keys. 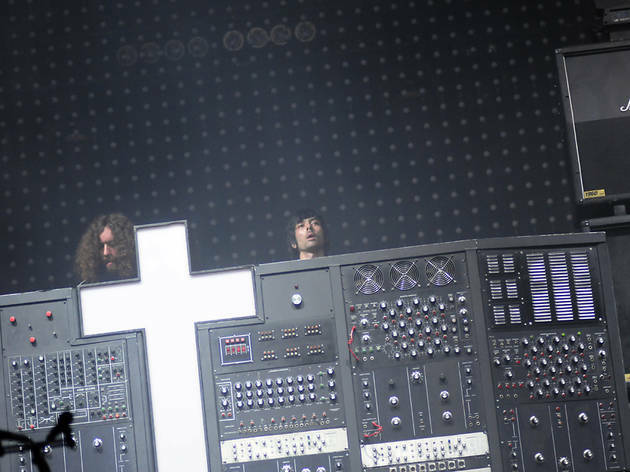 Daft Punk's epic and nearly religious tour of 2007–8 (spoiler alert: they make this list) is held as one of the greatest live shows of recent history. 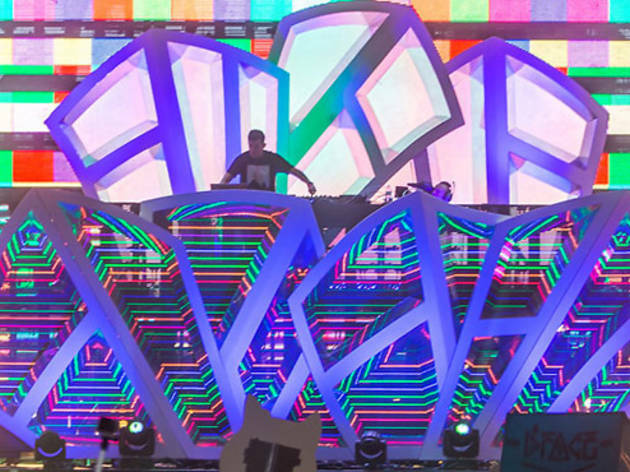 Which is why EDM acts have become a headlining staple at summer music festivals like Lollapalooza and Coachella. 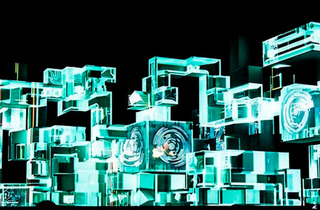 It should be noted that many of these incredible props and light shows are designed and built by one company, V Squared Labs in our own San Fernando Valley. 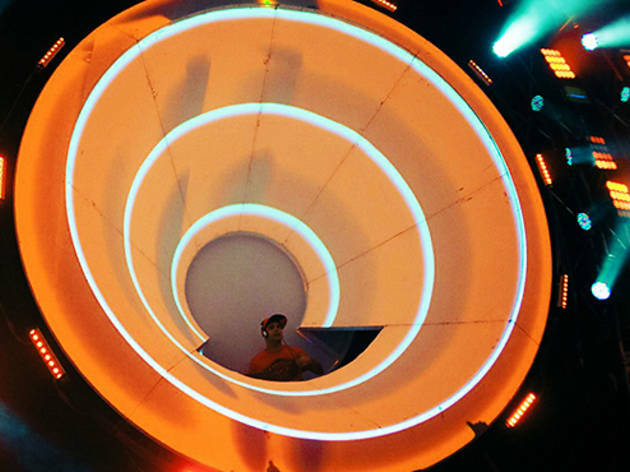 As we prepare for another round of fests, we look back at the most jaw-dropping DJ booths and stage shows in electronic music. Your move, Calvin Harris.